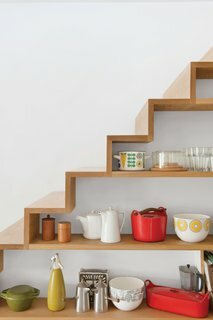 When a kitchen lacks space, everything seems a bit more difficult. From inadequate storage to compact countertops, suddenly the act of cooking feels more like a challenge than an enjoyment. However, if the scenario above sounds familiar, we encourage you not to throw in the towel just yet. By keeping the six guiding principles below in mind, you'll be steps away from transforming even the tiniest of spaces into a pleasant place to cook, bake, eat, and gather. 1) Keep the color palette simple. When you're lacking square footage, it's usually best to stick to a simple, neural color palette. Not only will this assist in making the space feel bigger, but it will also avoid a claustrophobic feeling of being overpowered by color, as bright shades can quickly feel overwhelming. 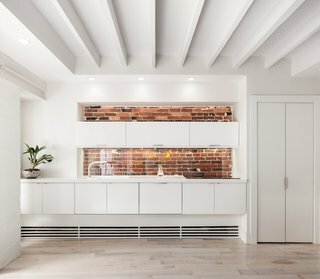 Most commonly, a crisp shade of white is used as the main color in smaller kitchens—often in a reflective finish—to keep the space feeling bright and airy. To further create the illusion of a larger space, opt for a glossy finish on cabinets. This finish will reflect light, instantly making the kitchen feel more spacious. 2)Maximize every inch of storage. 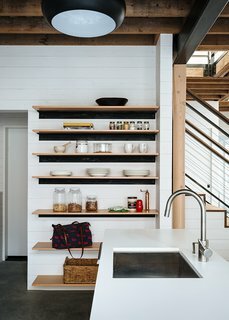 A large majority of people don't realize how much underutilized space there is in even the most basic of kitchen cabinets and drawers. Areas like triangular spaces and narrow nooks might seem awkward and unusable, but they can actually provide additional storage for smaller or less frequently used items. Even the insides of cabinet doors can be used, hooks can easily hang utensils, cleaning supplies, and other supplies. 3) Opt for appropriately sized appliances. 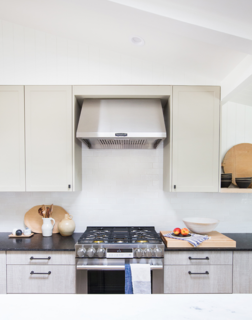 When selecting appliances for a smaller kitchen, remember to start with appliances that aren’t oversized. 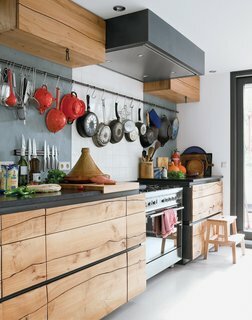 For instance, a 36-inch stovetop can take away valuable cooking space in a tiny kitchen, and chances are you don’t need more than four burners to begin with. 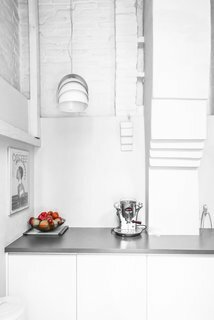 Similarly, a tall, narrow fridge can also free up more counter space rather than a wide, short fridge. That said, make sure to measure the size of your space and choose appliances accordingly, as many items come in a wide range of dimensions. 4) Invest in specialty drawers and cabinets. 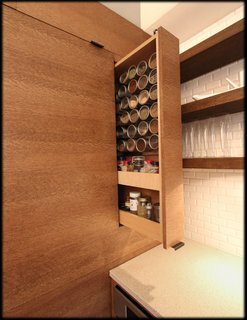 Whether it's a pull-out spice compartment or a Lazy Susan placed in a corner cabinet that's often underused, specialty drawers are often the unsung hero of a small kitchen. 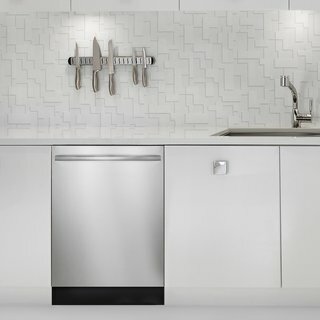 These fittings can be purchased from a range of kitchen supply stores, and are a phenomenal way to maximize space and stay organized. 5) Let your cookware be your art. Artwork is an essential way to infuse personality and meaning to a space, but when your kitchen is on the smaller side, let your dishes, cookware, and cookbooks do double duty and function also as a display. 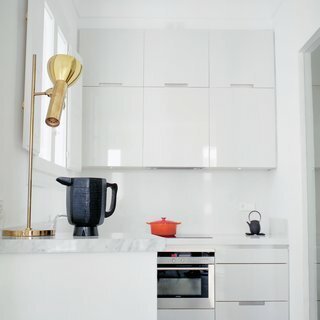 Whether it's hanging copper pots or displaying your glasses and plates on open shelves, arranging ordinary objects in aesthetically conscious ways can provide both beauty and function Furthermore, it will assist with staying neat and tidy—which is another key to maximizing function in a small space—and will also help you avoid accumulating clutter, as everything will be showcased. When a small room is not sufficiently lit, it immediately feels drearier and more cramped. If your kitchen only has one light fixture, consider under-cabinet lighting. 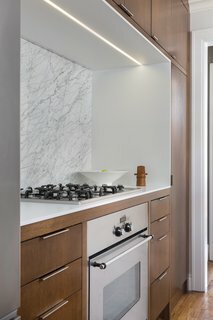 This is a great option that takes up no counter space, provides adequate lighting, and is virtually invisible at first glance.